Several years ago, when I was living in a small 12-unit apartment complex in East Austin, I needed to make something in a short period of time for a pot-luck dinner we were having that night. I had a little over two hours to come up with something. I was marginally employed at the time and had little money. All I had on hand were dried black beans, brown rice, onion and garlic (always), jarred pickled jalapenos, and spices. I decided to throw caution to the wind and make a batch of black beans and rice but I had not soaked the beans so I wasn't sure it would work. I put them in a pot with water, brought them to a boil, let them cook on high for a few minutes, then lowered the heat, added the rice, and let it cook for an hour. I threw in some onion, garlic, and spices (most likely cumin and oregano as they were and still are my go-to spices for Mexican), added more water, and let it cook for another hour. Mercifully, by the time I had to take the dish down to the courtyard the beans had cooked and were actually tender. Surprisingly to me, they were a big hit. There were no leftovers. One of my neighbors asked me for the recipe. I couldn't tell her what I had done - I had been in such a frenzy that I didn't remember even hours past the making of them how I had done it. I considered myself lucky, but made sure from then on to always leave time to soak my beans whenever I planned to make them. But that required vigilance, and did not always work out, in which case I would make something else and plan to cook the beans another day. I am happy to say that has now changed. I ran across this post a few months ago that shows how to cook beans in the oven, without having to soak them beforehand. I was skeptical, but beans are inexpensive enough and it was a small enough effort that it seemed worthwhile to test it out. It worked. Beautifully. The beans were perfectly cooked and tender, but still firm, as opposed to my pre-soaked beans, which often turn out more mushy than I would like. Contrary to everything I had heard about not adding salt too early in the cooking process, adding it at the beginning gave them an added depth of flavor that simply cannot be achieved by adding salt at the end of the process. I did cut the amount of salt in half, which was the perfect amount for me. I was eager to share this method, but I wanted to be sure that it wasn't a fluke so I have tested it several times, with several kinds of beans. I am happy to say that it works with every bean I've tried so far. It even works with chickpeas. You just have to cook them for a longer period of time. 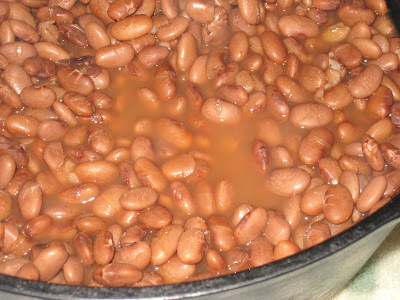 This method is not only easier, but to me it is also a better way to cook beans. As I mentioned earlier, they are not as mushy as the pre-soaked version, and the skins are more firm. It's a complete win-win. Easier and firmer, with much better flavor. I always cook a pound of beans, even thought it is more than I need for one dish. They freeze beautifully, so I always use half right away and then freeze the other half so I only have to cook them half as often as I plan to use them. Sort, rinse and drain a pound of dried beans. Place them in a heavy oven-proof pot with a tight-fitting lid. Add 1/2 a tablespoon of salt and cover about 1-1/2 inches over the top with water. * Bring to a boil over medium-high heat. As soon as the beans are boiling, cover them and put them in the oven on the center rack. Let them cook for about 1 to 1-1/2 hours. Start checking after the first half hour, adding more water if necessary. Check again in another half hour, then in smaller increments as they get closer to being done. 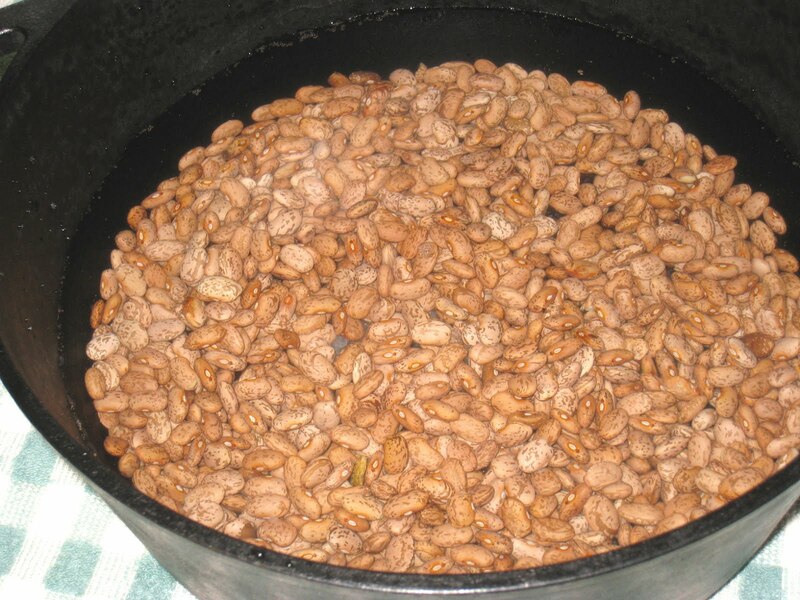 A pound of dried beans makes approximately 6 cups of cooked, which is usually enough to make two separate dishes. YMMV. *I usually cook the beans plain. When I am ready to use them I will cook them with onions, garlic, and/or bacon and whatever other herbs and spices I plan to use. If you want to cook the beans with aromatics and spices, you could add them in the beginning and cook them that way. Hmmm, they would probably taste much better that way, and you could still cook them up with more onions, garlic, etc., for even more flavor. I think I will do it that way next time. This simple recipe will find its way to my table very soon. I like the idea of not having to soak my beans overnight--and I have come to dislike canned beans. Thanks. I'm glad you're going to try it, Walter. This has truly changed my cooking life and I find that they really do taste better. Thank you for your comment! Great guide on cooking beans without having to soak them first! If you have insulin resistance, hypoglycemia, or diabetes, adding beans into your regular diet can be very helpful.